IN HONOR OF VALENTINE’S DAY, here are a few design and marketing-related sites I love (and hope you’ll love, too!). Veer.com. Sure, there are a lot of free font sites out there, but this one only has the best. Count on Veer fonts to have all kinds of great character alternates and lots of faces from which to select. Plus, with the addition of low-cost images, their well-curated image library is a must for designers on all budgets. Thebestdesigns.com. This is a gallery of exceptional website designs that will inspire and amaze. It’s a great starting point for any design project. Ted.com. Whenever I’m feeling stuck, I know I’ll find inspiration from any of the thousands of stories and videos from thought leaders of all walks of life on this site. Paper-source.com. Paper Source is always on trend when it comes to colors and invitation design. Their unique envelope shapes and sizes help me to think more creatively about print mailers. Netted by the Webbys. An e-newsletter that presents top websites and apps that are out there. They search the internet and bring the trends to me, so I don’t have to! 1. Network. Show up early and often to business networking events and start meeting potential clients or making connections with people who can benefit your business. Print a busload of business cards and pass them out like candy on Halloween night. 2. Send out an E-Newsletter. The start-up fees and monthly dues are very affordable. Once you have your template, it’s a breeze to update and send on a regular basis. Just make sure that your newsletter offers a real value to your subscribers, or you’ll quickly end up in their spam box. Consider, for example, a coupon for goods and/or services. 3. Blog. Keeping a blog helps your company to be found organically through the search engines, and lets people know your areas of expertise. Write about current projects, upload industry white papers, show examples of your work, stream video, and much more! Mix Creative’s blog (through WordPress.com) is completely free! 4. Update your Website. Archive your e-newsletters on the site, add an e-newsletter sign-up form, update your client list/products/portfolio and get rid of out-of-date information. 5. Focus on Customer Service. Remind your customers through excellent service why your company is a good value. It’ll increase both your repeat customers and your referrals. Shortly after Christmas, I picked up my son from playing at a friend’s house and immediately noticed a frenzied spark in his eyes. It’s a video game. Available for all of the major gaming systems (Wii, Playstation, Xbox), it uses the tried-and-true game formula of first-person adventure that children to adults are familiar with. The game has special gear. In order to get started with the game, you need to purchase the required accessories, namely a starter pack that has several plastic action figures and a special platform on which to place them. The platform informs the game system which character has been selected by the player. 1) Customize your avatar. What’s an avatar? Literally, it’s a virtual stand-in; but in social media it’s come to mean the screen icon that represents you—and accompanies any comment you make—on Facebook, Twitter, and any blog site. Unless you upload an image for your avatar, applications will use a default image to represent you and/or your company. Select an avatar that represents your company (i.e. a logo), or the representative who is speaking on behalf of the company (a photo or illustration of that person). AVOID: using pets, random images, or family pics as your avatar! Remember, this is a client-facing image that represents your brand. 2) Be conversational. Social media is at its heart, social. This means it’s a place to engage your followers in conversation—asking leading questions, chatting about what’s new, and providing information your audiences will find useful in their daily lives. While it’s OK to mention new products or services, this isn’t the place to try your hard sell. 3) Be consistent. Much like in-person networking, the more frequently you connect with your social network, the more they’ll come to think of your company’s products or services when they have the need. 4) Stay professional. Remember that social media is akin to business networking—you wouldn’t share dirty jokes or talk about your weekend in detail at a business networking event…would you? Social media should strike a balance between business communication and social communication. When in doubt, err on the professional side! 5) Join the conversation. Ever go to a party and get cornered by some bore who goes on and on about him/herself and never comments on something you say? With social media, it’s much the same! Reciprocate with your fans/followers by retweeting comments that resonated with you, replying via direct message to people on Twitter or Facebook, and comment on people’s Facebook and blog sites. They’ll appreciate the props, and you’ll increase your company’s exposure. THE RIGHT MIX OF CURIOSITY, FUN, AND PRICE MAKE THIS PROMOTION A WINNER! 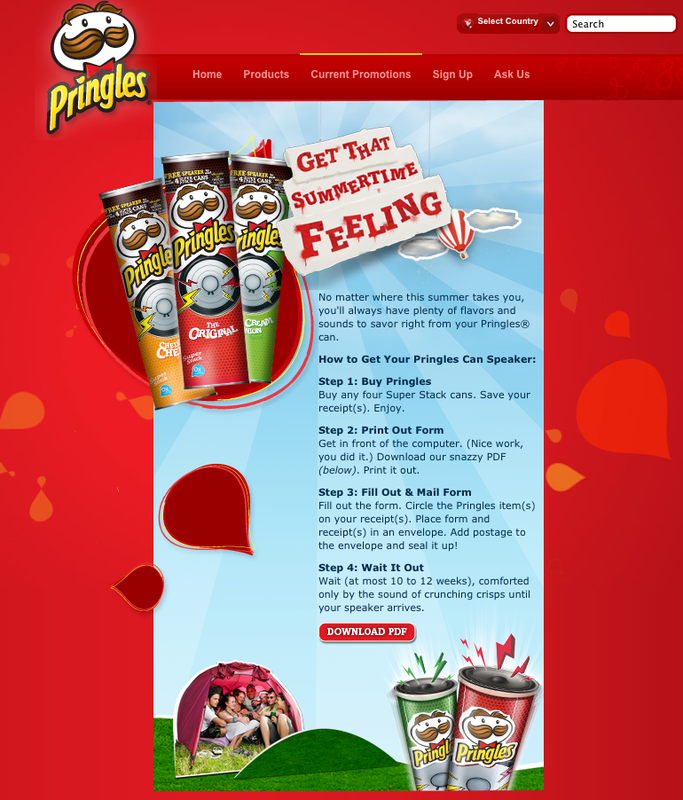 How to Get Your Pringles® Can Speaker.